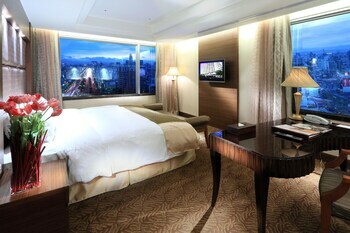 Considered booking a Taipei vacation package? It's a piece of cake with Expedia, and you'll be able to buy some fancy dinners or gifts for your friends back home with the cash you save. 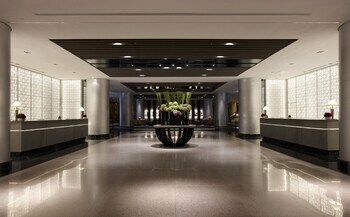 Crafty jetsetters can earn savings of up to 40,450 YEN* by purchasing a combined package deal on Expedia. With more than 400 partner airlines and 321,000 worldwide properties for you to pick from on our international database, you'll be jetting off on your next vacation in no time! You can postpone your travel bookings with us because we do not charge cancellation fees for almost all of our bookings. 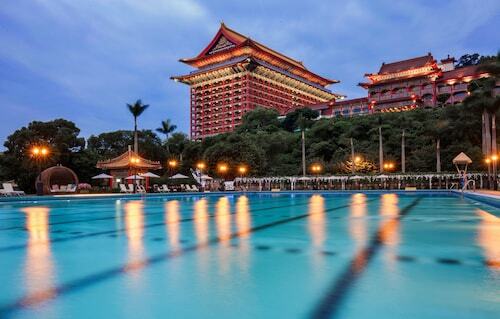 Almost ready to head off on your Taipei vacation? Can't decide what things to put on your travel program? No need to fret — we'll give you some of our top tips. If you're jetting off to Taipei, an outing to Taipei 101 and the National Palace Museum is almost obligatory. These world-famous attractions have played an integral part in putting this place on the map, and they're guaranteed to make a lasting impression. You'll find yourself surrounded by significant things to see and do, like Shilin Night Market and the Longshan Temple. If you're longing to make the most of your stay, be sure to check out the Taipei Confucius Temple and the Maokong Gondola. Memorial sites commemorate lives that have been lost and tragedies of the past. Drop by Chiang Kai-shek Memorial Hall and take a quiet moment or two to reflect. Travelers in this destination have heaps of options. Want to learn the stories of human history? Experience an expert insight into the people of the distant past at National Taiwan Museum. Still have time to spare? Sun Yat-Sen Memorial Hall offers a respite for reflection. Learn about the significance of this monument and find out more about why, when and how it was constructed. The world is alive with adventure, and there are countless wonderful experiences to be had when we grab our luggage and take a vacation. If you want to view the full range of activities, jump onto our Taipei things to do page. 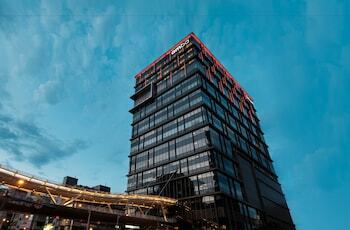 Taipei has 474 conveniently located properties, so why wait any longer? 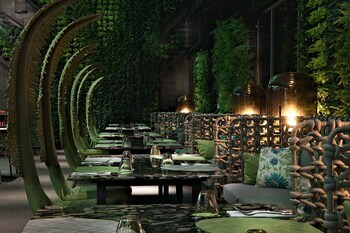 Pick your perfect accommodations for your next luxury getaway or cheap vacation with a little help from Expedia. Start the quest for an upmarket Taipei base by checking out the amenities at the Mandarin Oriental Taipei (158 Dunhua North Road) and the W Taipei (10 Zhongxiao East Rd, sec 5, Xinyi Dist). 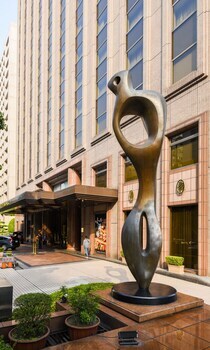 Alternatively, the Regent Taipei (No 3, Lane 39, Section 2) and the WESTGATE Hotel (No.150, Sec. 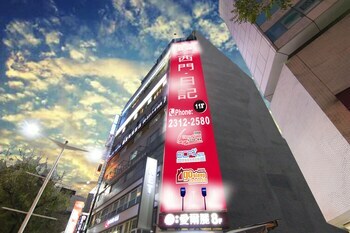 1, Zhonghua Rd) are two accommodations well worth investigating if you're traveling on a budget. Taipei 101 is an unmissable sight for those visiting Taipei. 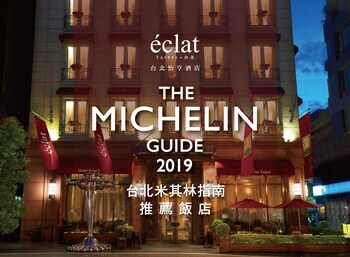 If you're eager to stay within close reach of this highly popular attraction, the Le Meridien Taipei and the Grand Hyatt Taipei are both fantastic picks. Nothing's more satisfying than finally coming in to land at Taoyuan International Airport (TPE) after a lengthy flight. Once you've collected your baggage and stretched out your stiff legs, you'll find yourself around 20 miles (32 km) from Taipei's downtown area. The mountainous district of Taipei is well known for its tea growing. Find teahouses, scenic views, hiking trails and Buddhist temples. Shop with everything at your fingertips at this large department store: from designer brands to electronics, Taiwanese delicacies and international food. 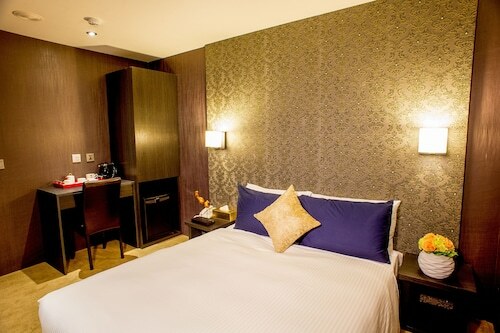 Located in Wanhua, this hotel is within 1 mi (2 km) of Huaxi Street Night Market, Lungshan Temple, and Presidential Office Building. Chiang Kai-shek Memorial Hall and National Taiwan Museum are also within 2 mi (3 km). 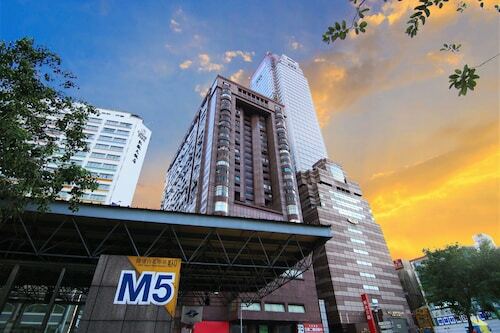 Taipei Wanhua Station is only a 2-minute walk and Longshan Temple Station is 6 minutes. 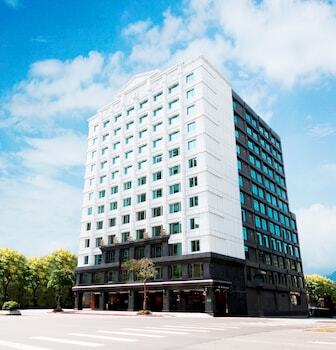 Located in Zhongzheng, this hotel is within a 10-minute walk of National Taiwan Museum and Presidential Office Building. Ningxia Night Market and Chiang Kai-shek Memorial Hall are also within 1 mi (2 km). Ximen MRT station is 9 minutes by foot and NTU Hospital Station is 10 minutes. 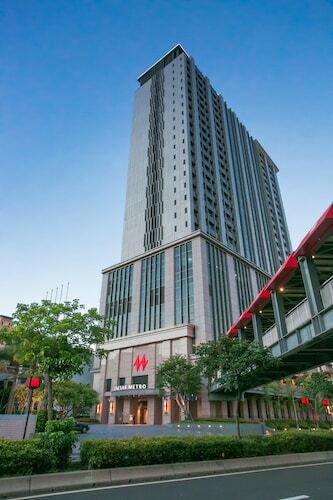 Located in Zhongzheng, this hotel is steps from Station Front Metro Mall and Shin Kong Life Tower. Taipei City North Gate and Chiang Kai-shek Memorial Hall are also within 1 mi (2 km). NTU Hospital Station is 7 minutes by foot and Taipei Station is 6 minutes. 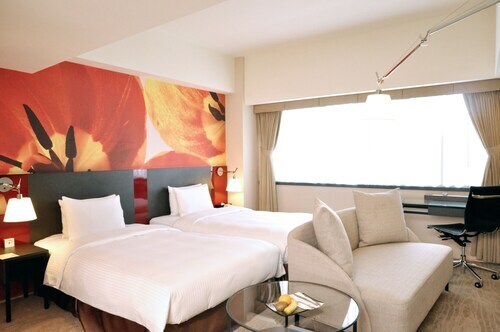 Located in Ximending, this hotel is within 2 mi (3 km) of Taipei Botanical Garden, Lungshan Temple, and Chiang Kai-shek Memorial Hall. Baby Boss and Sun Yat-Sen Memorial Hall are also within 6 mi (10 km). Beimen MRT station is 7 minutes by foot and Ximen MRT station is 10 minutes. 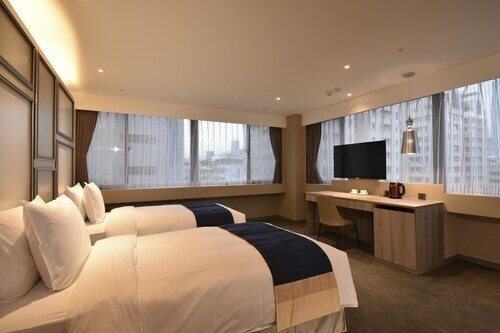 Located in Ximending, this hotel is within a 10-minute walk of Red House Theater, Presidential Office Building, and National Taiwan Museum. Lungshan Temple and Chiang Kai-shek Memorial Hall are also within 1 mi (2 km). Ximen MRT station is only a 3-minute walk and NTU Hospital Station is 11 minutes. 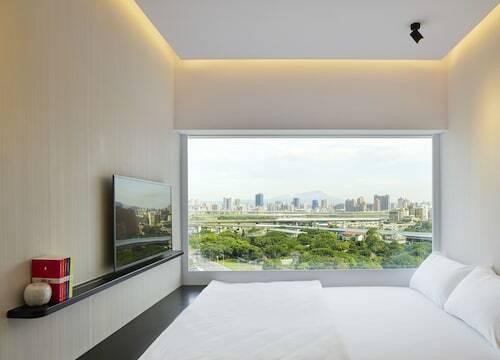 This family-friendly Taipei hotel is located near the airport, within 1 mi (2 km) of Shilin Night Market and Taipei Confucius Temple. National Revolutionary Martyrs' Shrine and Taipei Fine Arts Museum are also within 6 mi (10 km). Jiantan Station is 14 minutes by foot and Yuanshan Station is 24 minutes. 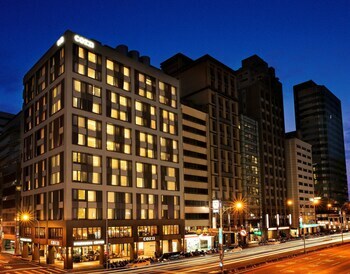 Located in Daan, this hotel is within a 15-minute walk of Zhongxiao Road and Sun Yat-Sen Memorial Hall. Taipei Arena and Taipei 101 are also within 1 mi (2 km). Zhongxiao Dunhua Station is only a 2-minute walk and Sun Yat-Sen Memorial Hall Station is 9 minutes. 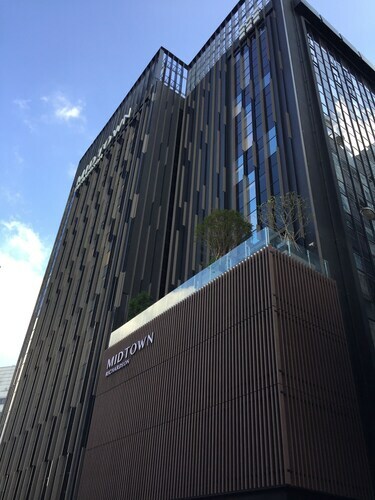 This hotel is close to the Presidential Office, the 228 Peace Memorial Park, the Shinko Mitsukoshi department store, Taipei Station, and the National Taiwan Museum. Nearby attractions include National Chiang Kai-shek Memorial Hall, Huashan 1914 Creative Park, Taipei, and Taiwan. Narita Intl. - Taoyuan Intl. Kansai Intl. - Taoyuan Intl. Chubu Centrair Intl. - Taoyuan Intl. TYO-All Airports - Taoyuan Intl.